The day began cold and very cloudy, but I made it to Johnsonville State Park at 8 a.m., and was soon hiking The Civil War Fort Trail. And, except for the guy grinding tree stumps (there are hundreds, perhaps thousands, of downed trees in the state parks this year thanks to the extreme winter), it was actually quiet. I even managed to startle a few White Tail deer, and the trail was pleasant with lots of views of the Tennessee River below. Even better, it ended with a pleasant ramble alongside the river. 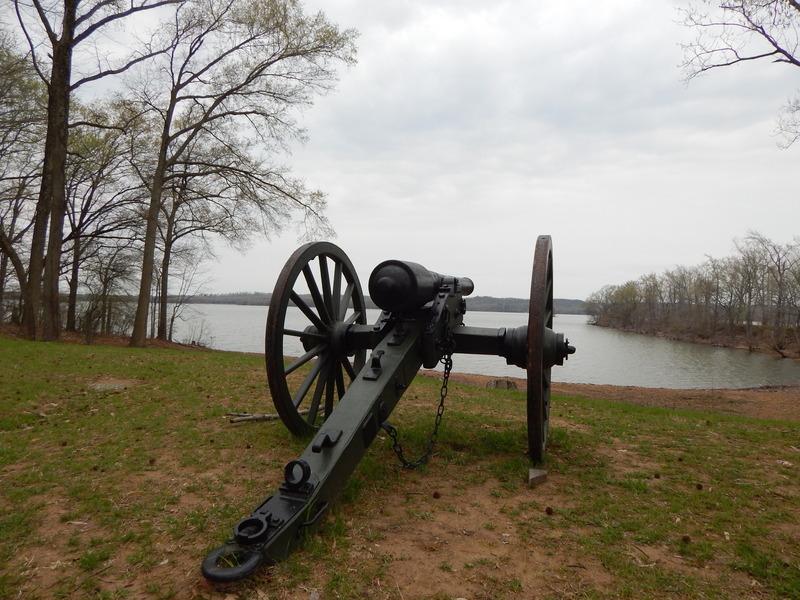 Cannon protecting any approach from the Tennessee River. I made it to Montgomery Bell State Park about lunchtime, and was pleased to spot a trail right away. The sun was now occasionally peeking out from behind the clouds, which made for a much better hike. As it was a one-way trail, I looked for the Ore Pit Loop because I don’t prefer having to backtrack a trail. 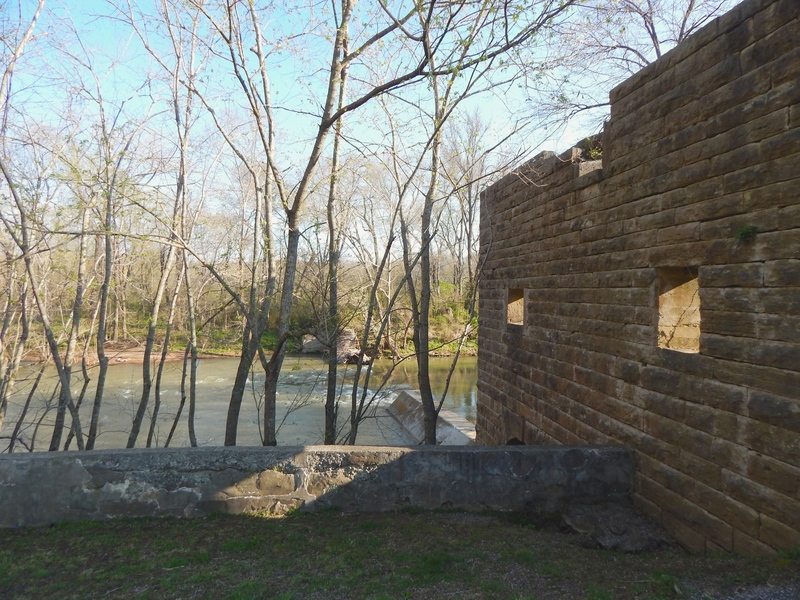 I found it tucked away at the end of the Cumberland Presbyterian Church shrine area. I know, one doesn’t usually associate the Presbyterian church with shrines, but this area is in honor of the founders, who established the church there on February 4, 1810. The chapel was built in 1960. By the time, I finished the loop, it was warm enough (about 60º) to be hiking without my windbreaker/raincoat. 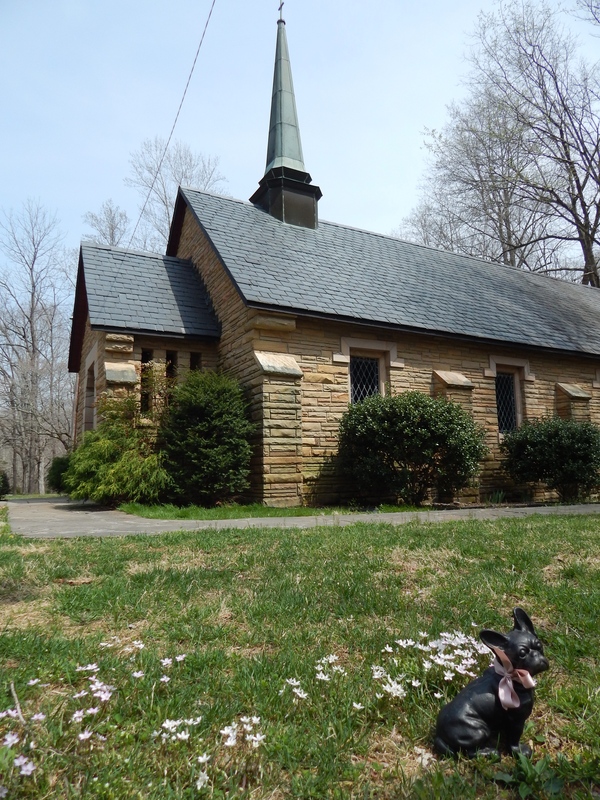 Rémy enjoying the partial sun (and Spring Beauties) outside the Presbyterian Church. It’s still cloudy with a chance of rain and thunderstorms, and it’s still going to get down to 39º tonight, but that should all disappear by tomorrow and be sunny for the first time on this trip–with a nearly balmy high of 64º. But we’ll see. We all know how often forecasts are correct. 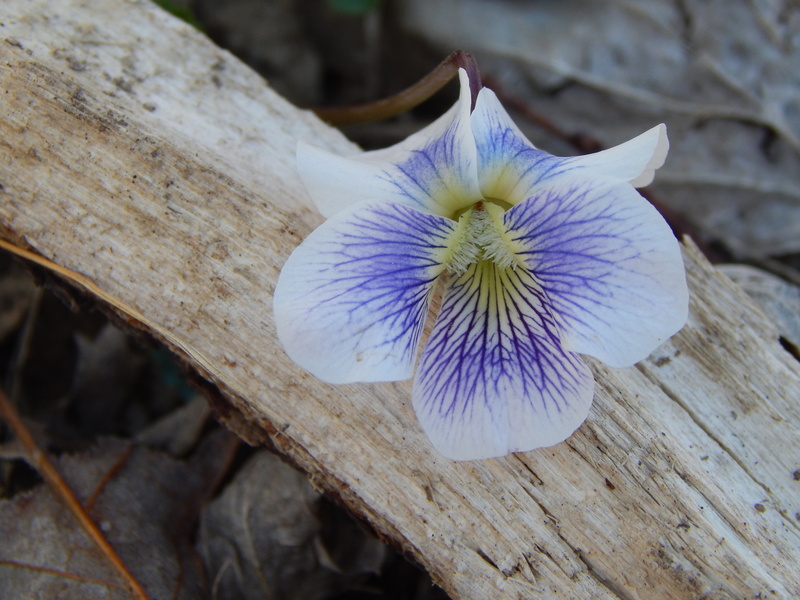 A violet in front of my campsite. The name was too good to be true. Honestly, everything was fine until I walked out of the bathhouse this morning sometime about sunrise–6:44 am. I was even thinking: Ha! I’ve reached a new low (heehee), I can camp when it’s freezing and do okay. And, then, something big and white and fluffy came drifting down from the sky. My first thought, being a South Georgia Girl, was “Ash! Is the Okefenokee burning again?” And almost immediately thereafter, “you’re in Tennessee. That’s . . .” and as I said, “snow,” suddenly the flakes were everywhere. And not the nice dry kind that bounce off things, but the big, moist flakes that land and melt. Don’t know if you can see it but there is snow sticking to the tent. 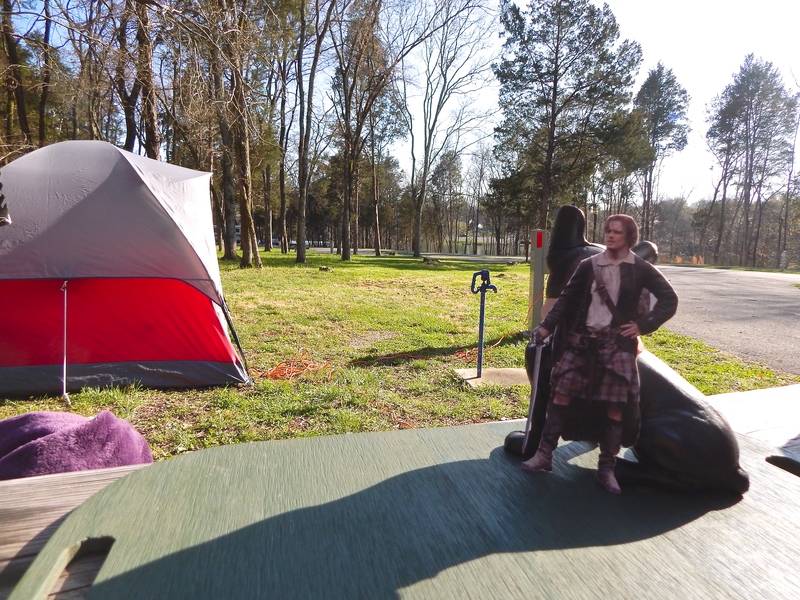 Oh no, I thought, my tent! Sure enough, the flakes were sticking to it. And while I was getting the last of my things out of it, my fingers were rapidly becoming numb. And, lest you think I am a wimp, I suffer from Raynaud’s Phenomenon (don’t ask me why it’s a phenomenon). By the time I was trying to fold the rain fly, my fingers were crossing the line from Raynaud’s and heading down that dark alley toward frostbite. I ended up having to just stuff my tent and tarp into the back of the car before running to the bathhouse in indescribable pain as my fingers were turning a deep purple. The pain was intense (and I have a high tolerance for pain) but I was able to bring the feeling back by running them under cool water; anything hotter hurt. Feeling human again, I drove to Natchez Trace where the attendant was kind enough to refund my campsite (as it was snowing and supposed to plummet to 23-degrees tonight and she agreed a tent wasn’t a good idea). I did, by the way, hike my trails in 37 degrees and snow. I had problems with my Raynauds on the the first trail (those lake winds) but was fine on the second–a pretty little trail through some former erosion gullies which I forgot the name of because I kept calling it “Fern Gully” to myself. So, 23 and snowing. Time to head South! Who knew that I would drive for more than an hour in a blizzard between I-40 and I-24? My windshield wipers were so caked with snow they could hardly move. I’m laughing now at the obstacles life loves to throw in our way, but it was harrowing at the time (for someone who hasn’t driven in snow in a number of years; when I lived in Virginia, it wasn’t that big a deal). And then I arrived in Georgia, and guess what? It was snowing even though it was a lot warmer and the sun was shining. Go figure. Rémy doesn’t look happy about the feathers in his cap. Not that Winter doesn’t have her moments, and there are times when she can be quite beautiful. But, when it’s her sister, Spring’s, time, she should step back gracefully and allow her her allotted time in the sun. Summer will be knocking at her door soon enough. But obviously we didn’t mourn Winter’s disappearance to her satisfaction because after several days of warmth, she has decided to reappear. Okay, enough anthropomorphizing of the seasons. The real question is: Has this winter not been brutal enough? 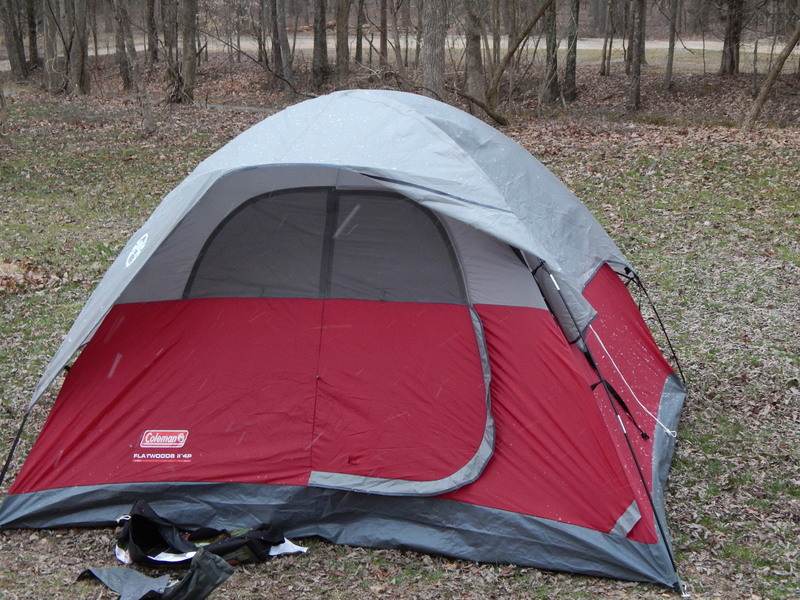 I was supposed to be in a tent tonight at Paris Landing State Park–my nicely ventilated summer tent. But, a number of factors sent me scurrying southward, the most important of which was the fact that it is supposed to plummet to 27 degrees tonight (and that’s without the winds off Kentucky Lake. Then I discovered the bathhouse I was camped next to was closed, which meant a good walk downhill to get to the next one. 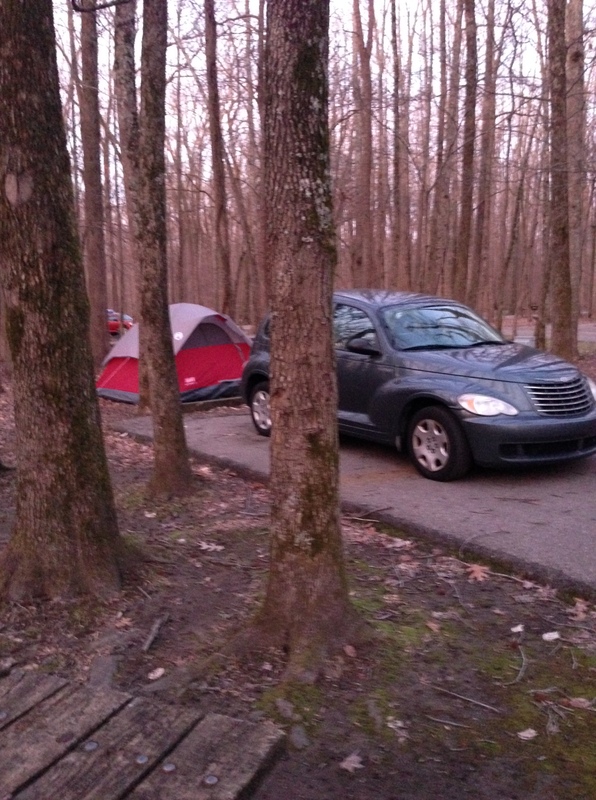 And, bizarrely, there wasn’t a single other camper in the campground, not even in an RV. That kind of spooked me. In addition, it was just a weird day all around. Early morning found me at Big Cypress Tree State Park. A tiny little place in the middle of nowhere and not a soul in sight. Everything was closed–park office, restrooms–all still battened down for winter. 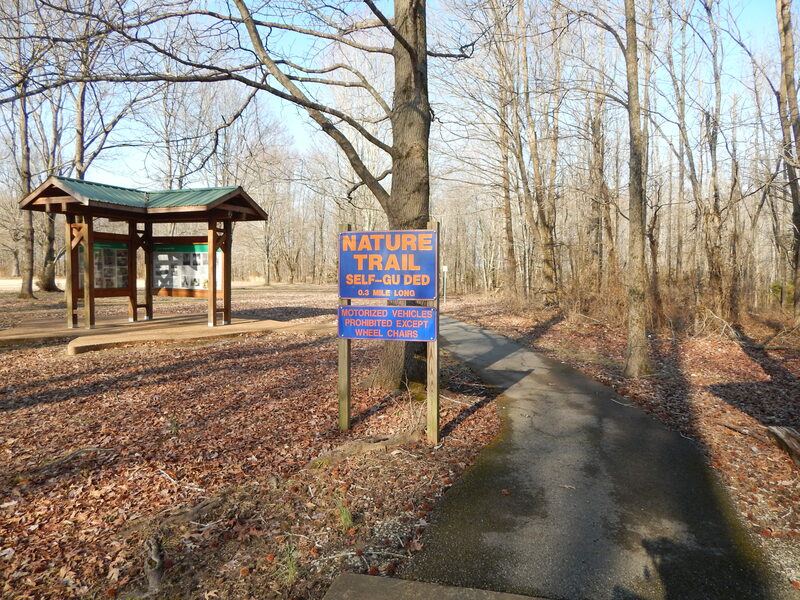 But, their .3-mile self-guided and ADA-approved nature trail was open, so I walked it. Obviously that didn’t take long. So, off to Paris Landing where–their information office is closed on weekends. Because nobody goes to state parks with marinas, restaurants, an inn and conference center, etc., etc., on the weekend. Okay, I thought, I’ll try the inn. Surely they’d have literature about the park they are located in. Nope. So, I drove around until I found the trailhead for their two trails (right next to the security building though no one was there, either). And now Paris Landing gets my unofficial vote for the most poorly marked trails in the state. The .6-mile Whitetail Loop was easy to figure out because of its tree identification signs. The 3-mile Raptor Trail, on the other hand, was nearly impossible to follow and I lost the trail completely once I arrived at the lake. I’m not even positive I was supposed to arrive at the lake. Maybe I was supposed to cut through the cabin area to begin with. 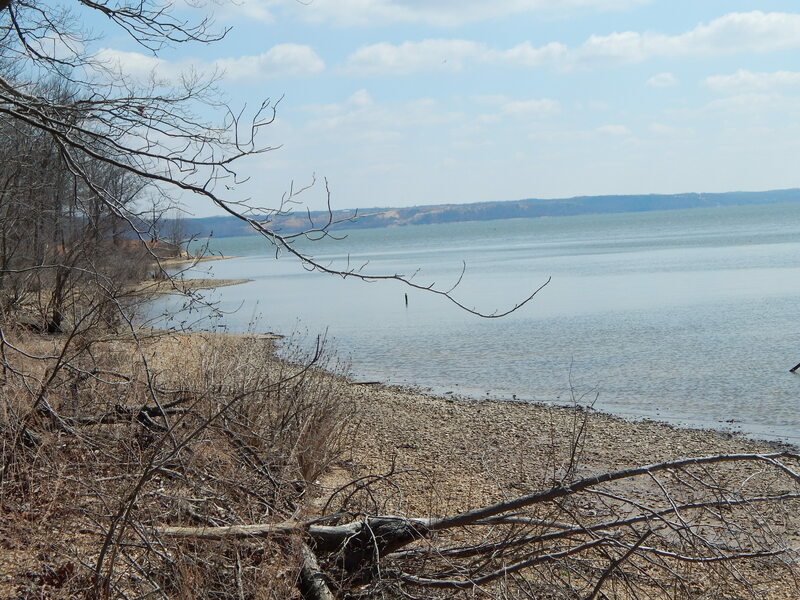 But, it was pretty down by the lake and, more importantly, I found evidence for why the trail is called the Raptor Trail. At one point while searching for signs of a trail or the yellow blazes that marked it, I happened on lots of feathers. No sign of the bird, itself, but enough feathers to indicate the poor little bird had been scooped up by a raptor. 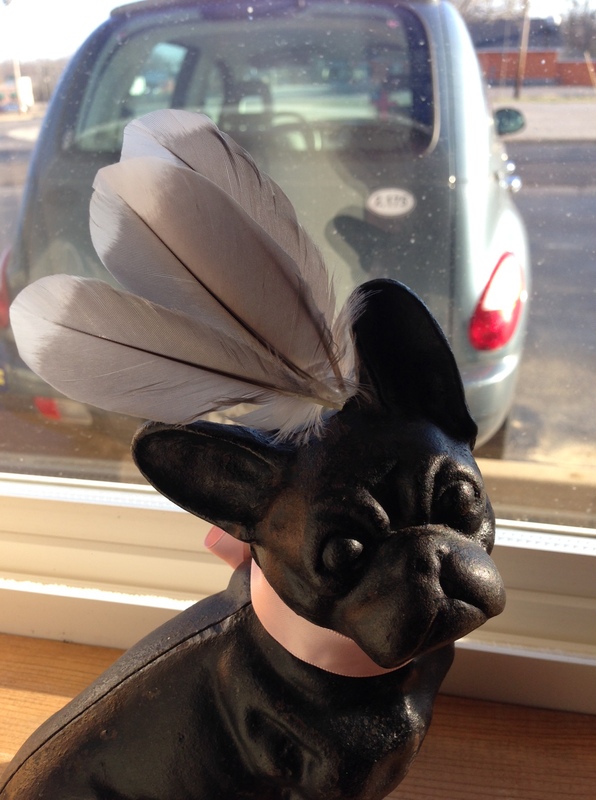 I brought a few of its feathers back with me–a small tribute to its sacrifice. So, now I am less than 10 miles from tomorrow’s park. It’s supposed to be a bit warmer, and I’ve already checked out the park: the woman at the office was very nice and helpful, they have an excellent trail map and I already have 1-, 3-, and 5-mile hikes planned, and my campsite looks just fine and it should be warm enough (that means above freezing for me) to camp. As I’ve noted previously, I really don’t like the cold. 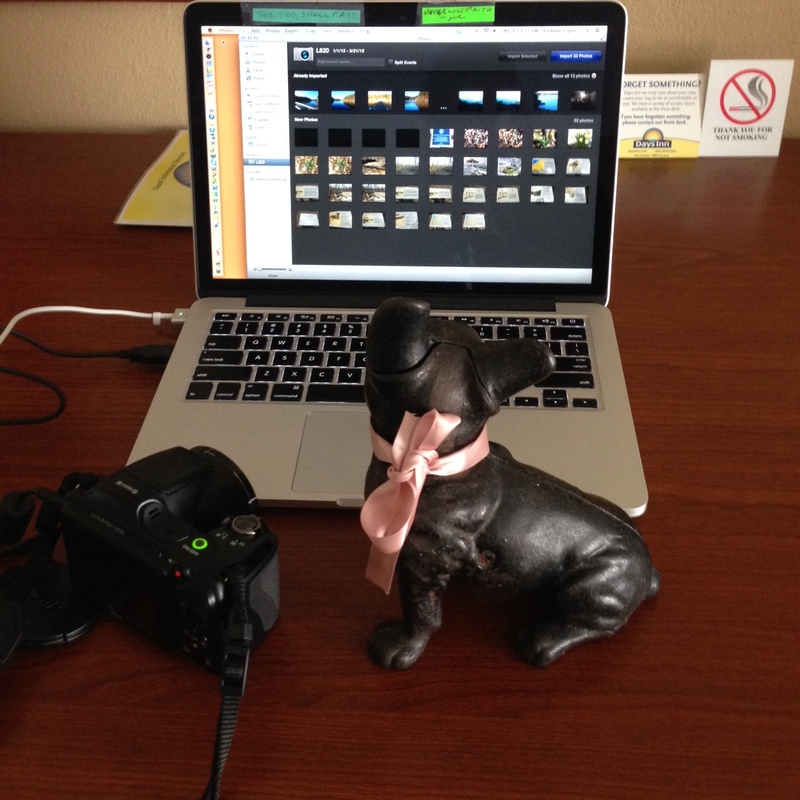 Rémy helps me upload photos from the first three parks. Turns out yoga and walking just don’t use the muscles you need to climb the hilly ridges and bluffs of the western border of Tennessee. It has been a lot of up and down these past two days and while it has been tiring and made my muscles sore, I know it has been good for me. Another Verizon-less day yesterday, but of course I have it here, in my hotel in Ripley, Tennessee. One of the reasons I chose not to camp at Fort Pillow today is because they have no electricity at their campsites. 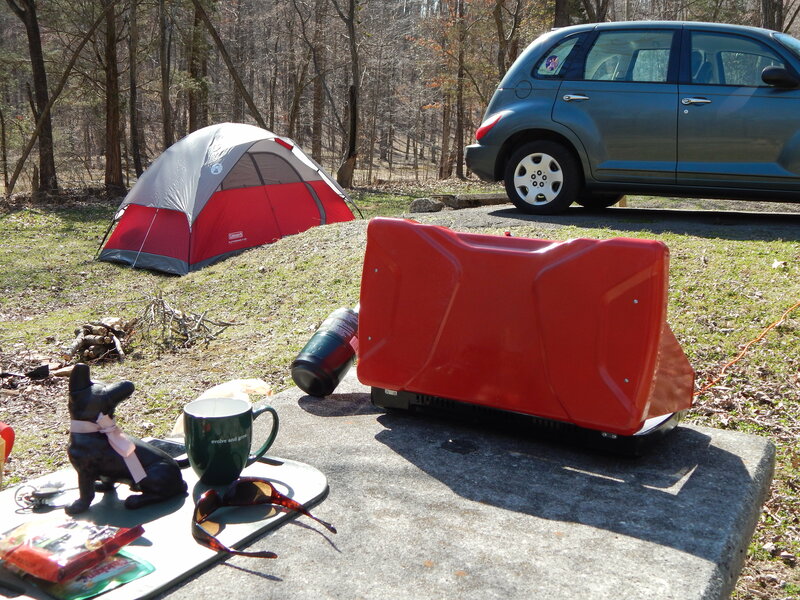 And, electricity was crucial this morning at my campsite in Meeman Shelby–I was able to use my space heater to warm up my 39-degree tent so that when I started hiking at 8 a.m.-ish, my fingers were functioning even after taking the tent down! Very happy camper. As for my first park–T.O. Fuller–hmmm. Just south of Memphis and practically sitting in the center of FedEx Distribution land. FedEx planes, trains, semis, you-name-it–that constant city buzz was ever present. Yet, despite the noise, still quite lovely. 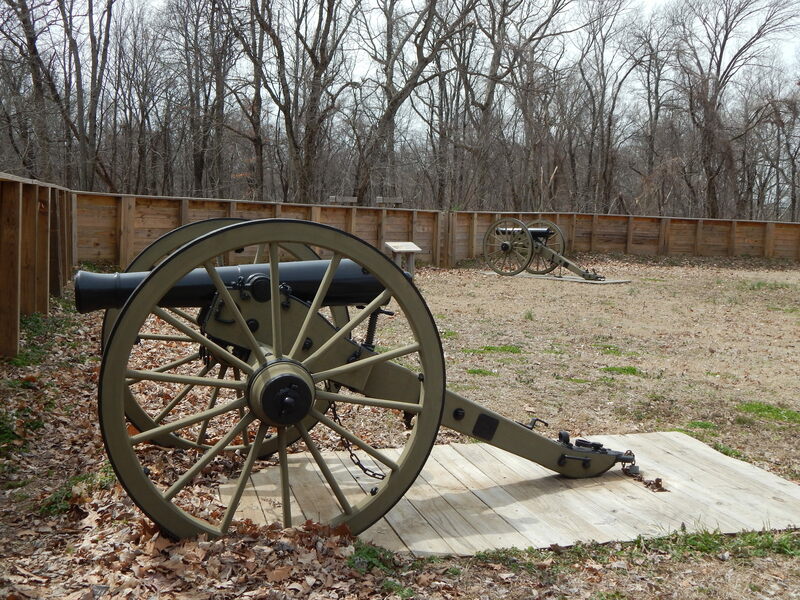 So, third park out of eight, Fort Pillow, is the site of a Confederate massacre. Yes, the South massacred nearly 300 Union soldiers, mostly African American, to their loss of about 14. I was going to do the 5-mile hike until I discovered a significant portion was on a road with relatively heavy traffic (for a park) that included huge dump trucks. So, I just went out to the fort and back for a 3-mile-ish hike. So, catching up here in Ripley for my last night in a motel before four nights of camping. Downloading photos was crucial because I forgot to do it yesterday. 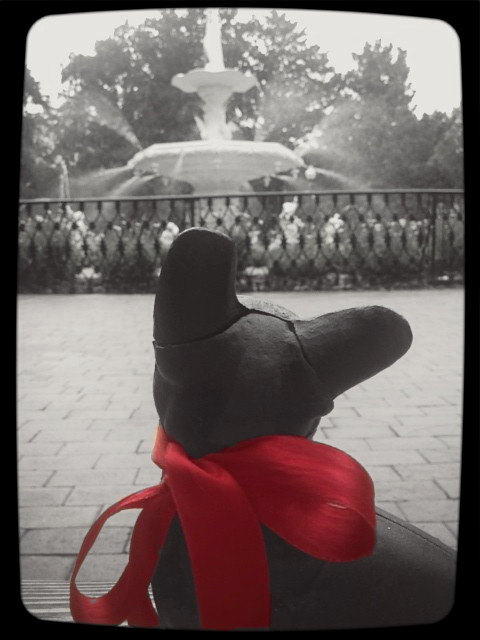 And I wanted to get one last blog in before I head to the next park because who knows if I will have internet access? Well, perhaps, The Shadow knows . . .